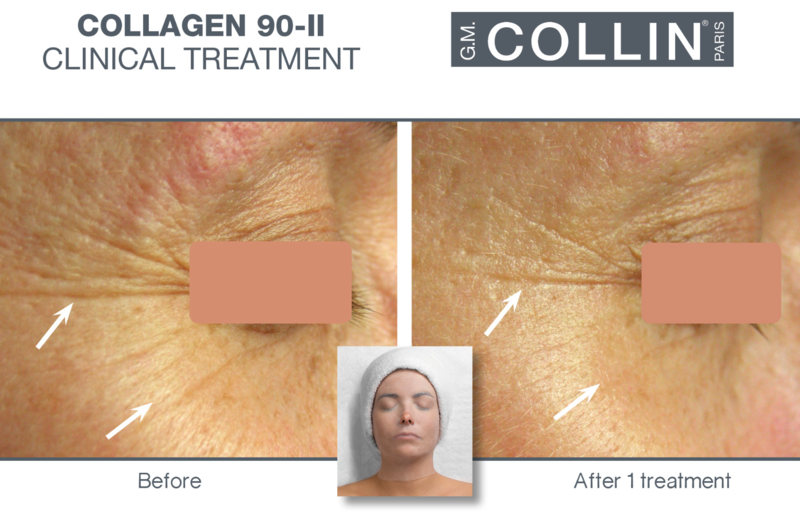 The Collagen 90-ii is an exclusive, highly renowned, intensively-rejuvenating treatment that dramatically minimizes any visible lines and wrinkles. So many people nowadays understand that collagen rejuvenates and tightens the skin resulting in the resurgence of a more youthful, flawless appearance ideal for fatigued and mature skin… so why not take advantage of it? Although individual results may vary, this facial has clinically proven results to reduce up to 94% of surface wrinkles. You can boost the results of this facial by picking up a bottle of our Native Collagen Gel to use at home. Although it does not contain the same concentration of the ingredients we use at the spa it is a great home product to use to see longer lasting results of the facial. Not only is this facial great for aging skin but also for unbalanced or dehydrated skin. It works wonders at bringing instant health to the skin. We recommend our GM Collin spa facials as the ingredients in them are more specialized and also a stronger concentrate than the products that can be sold for use at home. This isn’t because we don’t want you to have the strong benefits at home but because there are regulations around the concentration levels of products that can be sold for home use. Kind of like you can get fluoride treatment at your dentist office but you are not able to purchase it for home use. So come on in and get great results by quenching your skin with these moisture-replenishing ingredients for a plumper, firmer, more radiant complexion! After your facial treatment be sure to ask about any unadvertised specials we may be running along with our monthly specials! You might catch some great deals!